- What type of cranberry do you suggest? Thank you for any help you all can provide. I would use something like the Just Cranberry Juice from RW Knudsen. Can’t say on the amount. Frozen and smashed berries would work, but extra effort and time. Since you don't want to overwhelm your cream ale, I would try 12-16oz/5 gallons of frozen berries. The exact time during fermentation to add and the form of the cranberry is probably not that important as cranberry isn't particularly fragrant. I would add right after krausen peaks and then taste a few days later. Add more if you like. Fresh cranberries will give less character than would expect compared to other berries. Cranberries just don't break down either by freezing or by soaking in beer/cider. Concentrate or good quality 100% juice will gie you a lot more control over your end result. If you do choose to use berries, put them through 2 freeze/thaw cycles and crush them after each thaw to help them break up better. I am always amazed at how well my berries hold up after a hard frost, and even after a year in the freezer they are pretty firm after thawing (just ask my ducks lol). I use fresh cranberries in mead. Just pulled them in a food processor and put them in a mesh bag in the fermenter and they give all their flavor and color. Why have I never tried this instead of my convoluted freeze/smash/freeze/smash procedure? This makes me wish that my chickens didn't eat all my cranberries this year. I have a cider ready to keg and cranberry cider is awesome. 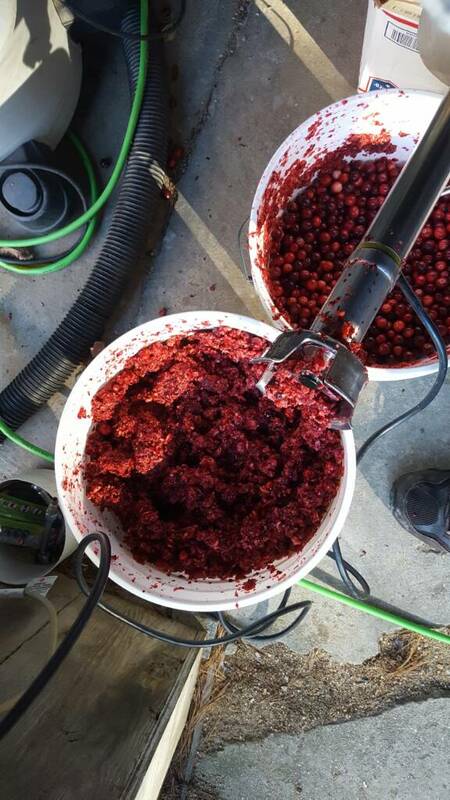 The robocoup 450 turbo Bermixer is a good way to prepare 2 crates of cranberries. Sounds good - cranberries in beer, cider, and mead. FWIW, I've made cranberry liqueuer from fresh food processed cranberries and that too is outstanding!